As I mentioned a few weeks ago, I was lucky enough to get a behind-the-scenes look at the Walt Disney World Railway in March while on vacation. And even though I am not a huge fan of Disney, I found the tour to be a fascinating inside glimpse of a tourist railway. So, here are a few random facts that I learned about the railway. 1. Walter Disney was a huge railfan. It all started in his childhood in Marceline, Missouri. Walt was intrigued by the AT&SF Railway that made its way through town. Today, BNSF still makes its way through that town. Walt never really forgot his hometown. Inspired by his love of trains, he built a giant outdoor railway on his property in California. He had to make one giant concession in order to convince his wife to allow him to build the railway. He had to agree to dig a fairly lengthy tunnel beneath her rose garden, so his railway wouldn't destroy her prized sanctuary. The creation grew to be a local attraction, as he often invited a number of people over to his house to ride on his railway, including Salvador Dali. There's a picture of a dour looking Dali riding one of Walt's trains. It's a surreal image. 2. It all started with a visit to the Henry Ford Museum. The Disney company doesn't shy away from mythology when it comes to its founder. The company often reminds visitors to the park of Walt's musing that the entire company began with his drawing of a mouse. In some ways, though, the beginnings of the Disney empire began with Mr. Disney's visit to Greenfield Village in the Detroit area. The attraction is part of the Ford family's empire (the car company family, not the Canadian political, uhh... family). Greenfield Village is first and foremost a collection of historic buildings that is meant to show visitors a piece of America's past. Walt was so impressed by the idealized village he saw that he used it as inspiration to create the original Disneyland in Anaheim, Calif. That park, in turn, formed the basis of the Magic Kingdom, which is one of four theme parks that make up Disney World in Florida. Walt's idea was to recreate an idealized Main Street, much of it based on his hometown of Marceline. He then aimed to build a theme park around that small slice of America. One thing he always knew he would do was surround the park with a railway. The original theme park is bounded by a railway, as is much of the Magic Kingdom in Florida. 3. The Walt Disney World Main Street train station is based on a real station. The railway surrounding the Magic Kingdom has stations at Main Street, USA, Frontierland and Fantasyland. The focal point of the entire park is the railway station at Main Street, USA. When you enter this park, this station is the first thing you see. Even inside, it has the look and feel of a railway station of the early 20th century, with benches, ticket booths, railway signs and route maps of various real railways, including the Santa Fe and Union Pacific. 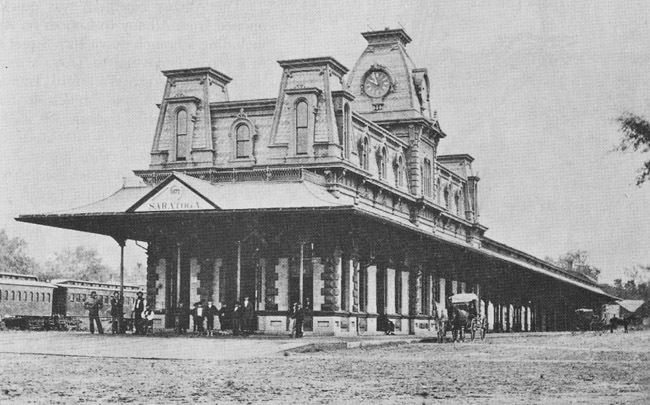 The main station, surprisingly, is not based on the station in Mr. Disney's hometown; rather it's based on the old Grand Trunk railway station in Saratoga Springs, New York. Even the Frontierland station is based on an actual trackside freight structure in Marceline. 4. The railway is the real deal. The railway has reporting marks (WDWRR), operates on a 1.5-mile (2.4 kilometre) loop of three-foot-gauge track and is fed by a spur from the roundhouse. The railway has four Baldwin-built steam locomotives that date from 1916 to 1929. The train crews operate on a block signaling system, given that two to three trains can be operating on the loop at any given day. All crews have to follow normal protocol when crossing the railway's one level crossing. In order to gain access to the 1.5-mile loop that serves the park, trains have to cross one fairly busy access road that park employees use throughout the day. The steam engines approach the crossing with the customary two long, one short, one long whistle pattern to signal their approach. The railway even has a fairly challenging two-per-cent grade leading up to the Main Street Station. You can hear the old steam engines working hard as they climb this grade, chuffing all the way. If you've never heard a steam engine make this noise, it's a real novelty. 5. As you might imagine, this railway is busy. The railway is essentially a hop-on, hop-off operation that any park visitor can ride at any time as part of their admission price. The railway sees an average of about 3.7 million riders each year. I dare say there are few if any tourist lines boasting such ridership. There are some really interesting facts about the actual locomotives they use on the railway, but I wanted to keep these for another post. Stay tuned. I don't know if I can properly describe how important it is for my blog to have regular or even semi-regular contributors. When you live in Ottawa, your railfanning opportunities are limited, to say the least. Although there is no shortage of news coming out of Ottawa right now when it comes to railways, I always feel as though I am cheating myself and the readers when there aren't any compelling images to go along with the topic I am exploring. All that to say, it is always a great surprise when I get photos and news tips from my fellow rail enthusiasts from Eastern Ontario and elsewhere. This week, I thought I would play a little bit of catch-up and present some of my favourite contributor images from the last year and a bit. I have to admit, I have a large backlog of submitted images. Unfortunately, I can't always use them right away and sometimes I can't fashion a full post out of the contributions. But that always leaves the door open for collections of random photos, which is always fun for me. For the first photo, let's head overseas to Portugal. My in-laws spent a few months in Europe last spring, in Spain and Portugal in particular. They were nice enough to take train photos for me, including a number of shots from a railway museum they visited in Spain (stay tuned for that post). This shot, from the Lisbon train station, gives you a good idea of the iconic design of the station's platform and canopy. I also liked this shot because the engine reminds me of the old Bombardier LRC locomotives that once prowled the Windsor-Quebec City corridor for Via Rail Canada. My in-laws took trains just about everywhere they went during their European adventure and spoke glowingly of the passenger service there. Take a guess where this shot came from? That tower in the background is the Calgary Tower. This shot is courtesy of my brother, who snapped a shot of a long line of hoppers parked in Calgary's downtown. He took this shot in the summer of 2016. I haven't really had any opportunities to include any of his Calgary photos in a post, so I figured I would share this shot, more for the Calgary skyline than anything else. 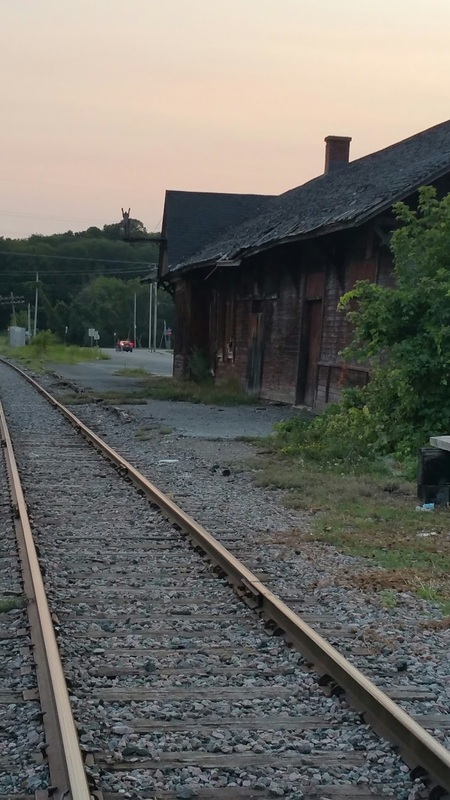 This shot is courtesy of fellow Ottawa railfan Keith Boardman, who snapped a few images of the old Masson passenger station in Masson, Que. This station, which appears to be in terrible shape, sits along the Quebec Gatineau Railway, although most people know this line better from its time when it was part of the Canadian Pacific Lachute Subdivision. This line also hosted Via Rail's northern service between Ottawa and Montreal, so called because the line runs north of the Ottawa River. You can read more about Via trains along the Lachute Sub in this post on Trackside Treasure. As Keith pointed out to me, it's been decades since this station saw any passenger service. It doesn't appear as though there are any efforts to preserve the old station. I like this shot because it shows just how well maintained the tracks appear to be, which can't be said for the station, sadly. 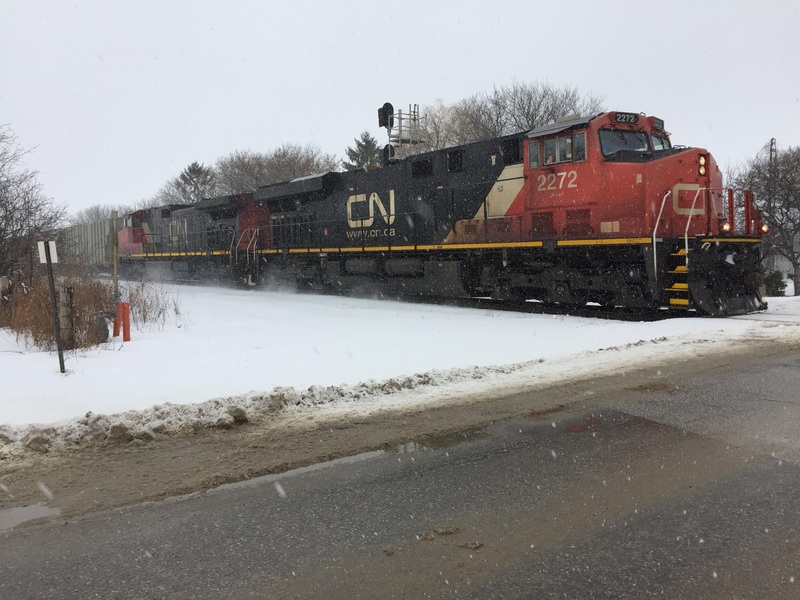 My brother snagged this dramatic shot of a CN freight headed west toward Sarnia on the Strathroy Subdivision. This shot was taken at the Mandaumin Road level crossing in January. My brother mentioned the other day how he saw a freight train being pulled by four locomotives that all bore different logos: CN, NS, UP and CSX. Reading up on why, it appears that CN has leased some power recently to keep up with an unexpected increase in freight traffic. One article I read was critical of the railway for not being ready for the rebounding traffic. I don't care about that. I find the prospect of being able to see UP, NS or CSX engines on CN freights to be exciting. One final note. Radio-Canada has reported recently that the Bytown Rail Society has reached out to proponents of a tourist train on the old CP Maniwaki Subdivision. The society has offered some of its equipment for use in a new tourist operation. There has been no tourist train on this line in years, thanks to wash-outs along the right-of-way that have proven too costly for the rail's owners to fix. The old sub is owned by the municipalities that the line runs through. The article, in French, mentioned that the idea might not receive a warm reception, since efforts have already started to convert the old Maniwaki Sub into a recreational path. These last few weeks have been hectic, to say the very least, especially concerning my job, my health and my family. I just returned from a family vacation to Florida and am now in the midst of a job transition, which has required a great deal of studying for the required government language tests. On top of all that, I have just recently gotten over one of the nastiest colds that I have encountered in years. All that to say, I have not been able to put the time and effort into several upcoming posts for this blog. And it's a shame because I have some interesting material to cover. Without getting into too much detail, I was able to take advantage of a little known behind-the-scenes tour of the Walt Disney World Railroad while on vacation with family. If you are like me, you are not much of a Disney fan. I didn't really grow up with Disney movies and cartoons (I was more of a Looney Toons fan) and I am not much a theme park fan. However, marrying someone who grew up with Disney and having two young daughters has forced me to take a closer look at all things Disney. The tour of the company's theme park railroad was much more interesting than I ever thought it would be. I was quite amazed at all the things I learned about Walt Disney and his absolute love of trains. The company founder's love of trains really has influenced much of the company's little narrow gauge railway, which is an amazing little operation. In the coming weeks, I will share some of the little known facts and behind the scenes looks from my time watching this railway. Was there ever a doubt that Ottawa's new light rail line would not open as scheduled? I for one, am not surprised. The media has been speculating about delays to the Confederation Line for a number of months. Despite assurances that the infamous sinkhole incident on Rideau Street would not delay the project, it appears that the giant hole and several other factors doomed the original completion date, which was supposed to happen in April. That means that, for now, the new Alstom Citadis Spirit trainsets will mostly sit under the roof of this facility on Belfast Road, near the Via Rail station. I snapped this shot a few weeks ago. The delay has raised a few important questions regarding who will be left on the hook for the costs associated with the delay. When the delay was first announced by our mayor, several indignant city counsellors stressed that the city had language in its contract with the Rideau Transit Group (RTG) that would allow the city to charge the group $1 million for missing its deadline. That suggestion was shot down by the mayor. A few days after that discussion, the city revealed that the delay to the Confederation Line opening will cost as much as $10 million a month, including the additional salaries that will have to be paid for bus drivers since the current bus transit system will have to continue operating. Many drivers will be laid off once the Confederation Line displaces countless express bus routes between the Confederation Line's endpoints, Tunney's Pasture and Blair. Nothing definite has been disclosed, but the RTG has been told it will be covering the costs in the coming months since the city signed a fixed-price contract for the entire system's construction. 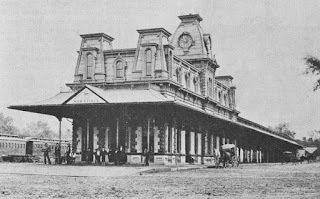 Here's a shot of Tremblay Station, near the Via Rail station. The east end of this line is much further along in its development compared to the west end of the line, including Pimisi, Bayview and Tunney's Pasture stations. Here's another shot, which gives you a glimpse of the right-of-way, which uses the old bus Transitway that once served the Via Rail station. For now, the only action you will see on the Confederation Line is maintenance-of-way equipment, mostly in the form of hi-rail trucks and some pretty odd looking maintenance cars. This shot below shows you the types of grades that you don't see with heavy rail operations but are common with light rail operations. I'm not a huge fan of railfanning light rail vehicles, but for those so inclined, this is about all you will see in Ottawa for the next few months. The Trillium Line continues to operate in the shadow of the Confederation Line. A few final notes. A University of Ottawa professor has made the obvious suggestion (at least to me) that the city should look into using the Confederation Line for freight purposes as well. This system works in other cities, when freight trains make use of commuter rail line during off-peak hours. Ottawa is a city that is absolutely choked with trucks. You'd think politicians would embrace freight railways as a way of taking trucks off the highway and especially out of the downtown. Of course, those who read this blog know I've been advocating this all along, but I wonder how effective any freight operation would be with such dramatic grades on the Confederation Line. Also, the city revealed the names of all the O-Trains, including those operating on the Trillium Line (Ellwood Sub). The city opened up the naming contest to students and received nearly 2000 submissions. The winning submissions were initially well received, although I did read today that some people aren't happy about the lack of diversity in the names. I would link to the story, but I really don't think it's a worthwhile read. I had a hard time getting through it without rolling my eyes. Everyone's a critic and no one is ever happy. Pretty typical for Ottawa.